NASA and Yahooligans " Ask Earl"
News, Discussions, Chat, Pictures, and more! Join SFRSA's eGroup on Yahoo. It's free and it's fun! 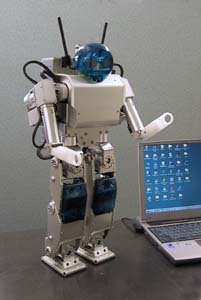 An Opportunity to Encounter Diverse Robots...The Japan Association for the 2005 World Exposition will conduct a Robot Project at EXPO 2005. The project will feature working robots that clean, patrol, guide visitors, and perform other tasks, as well as prototype robots...Japanese people have had an affinity to robots for decades, largely due to their depiction in animation and other fiction...[Program tracks include]...Working Robots...Five types...Prototype Robot Exhibition...63 prototypes...held for 11 days from Thursday, June 9, to Sunday, June 19, at the Morizo and Kiccoro Exhibition Center...Robot Station...the hub of the Robot Project. 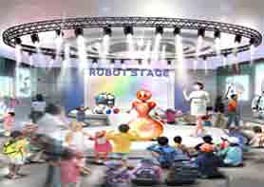 The pavilion will include a stage on which working robots will give demonstrations...visitors will be able to interact with robots at any time..."
"RoboNexus is a multifaceted international forum bringing together all of the major players driving the burgeoning personal, service and mobile robotics markets. 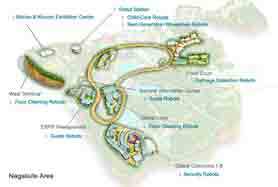 RoboNexus includes over 50,000 square feet of expo and will feature the latest robotics products, technologies and applications." 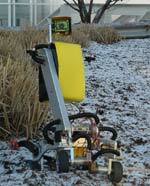 A popular economically priced mobile robot was the line of "R2D2 like" PC-based machines from "White Box Robotics". The star of the Expo was the next generation Humanoid Robot Kawada Industries HRP-2 "Promet", the final robotic platform for the Humanoid Robotics Project in Japan, whose 1st generation products included the Honda Humanoid Asimo. Enjoy video clips of the event & of "Promet" in action on the Kawada & Yahoo video search sites. from Fumihiko Abe ("Gromit") ! 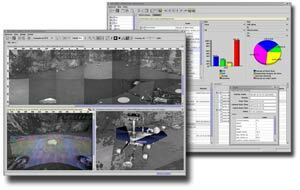 Phone (215) 740-7397 Fax (215) 619-2766 email: sales@forestec.com"
The Jet Propulsion Laboratory has released Maestro, a public version of the primary software tool used by NASA scientists to design goals for the Mars Exploration Rovers and analyze the images received from Mars. Anyone can download Maestro for free from http://mars.telascience.org/ and use it to follow along with the rovers’ progress during the mission. You can use Maestro to view pictures from Mars in 2D and 3D and create simplified rover activity plans. During the mission, updates will be released for Maestro containing the latest images from Mars. On the Maestro website, you can download a scaled-down version of the program that NASA scientists use to operate Spirit and Opportunity. Data Updates are also available for Maestro that contain real data from Mars that you can add to your copy of Maestro. 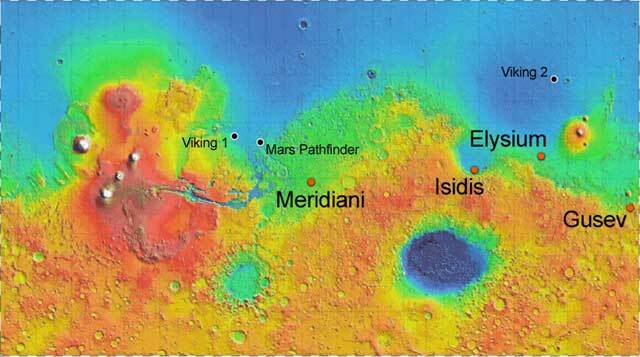 Go to the Updates section to download all of the latest data from Mars for Maestro! For NASA Mars Exploration Rovers (MER) January 2004 MER landings on Mar next year, an Adobe Atmosphere Virtual Worlds Builder with Physics simulator & Avatars... DigitalSpace Founder Bruce Damer has setup the "Drive on Mars" website..."Drive on Mars" can model mars surface that MER sees and allow people to drive on Mars virtually...Bruce has done considerable earlier pioneering Atmosphere work for NASA Ames, including a virtual habitat on Mars & a Simulation of the International Space Station with the Personal Satellite Assistant (PSA) robot. The Netherlands' Kees Veenenbos, on his "space4case" site, has rendered landscapes and 3-D animations and fly-bys of Mars, made with the NASA Mars Global Surveyor (MGS) Mars Orbiter Laser Altimeter (MOLA) data and NASA PDS files. The scenes are rendered as they look today, including winter iced areas, & through simulation, may have looked 3 to 4 billion years ago, with water. The NASA data is converted to Digital Elevation Map (DEM) files, enabling generation of accurate 3-D landscape, over which the camera view data is essentially "texture-mapped", producing a view of Mars as it actually appears, in 3-D with natural colors & textures as photographed by the MGS cameras - during a virtual fly-by, just like being there. 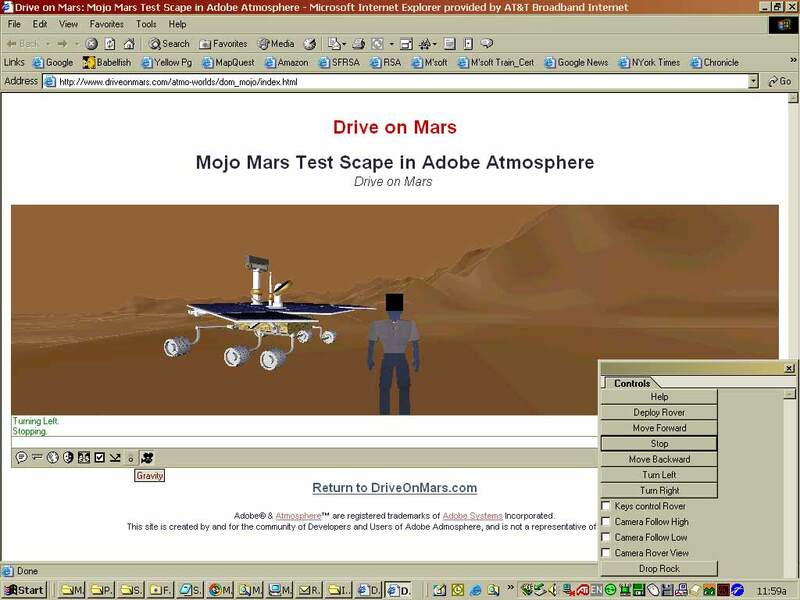 For the current Mother of All Mars MOLA Movies, "Mojo Mars", depicting NASA Mars 2003 Exploration Rover (MER) at Gusev Crater candidate landing site, visit Adobe Atmosphere Virtual Worlds Developer Bruce Damer's Digital Space Commons "Drive On Mars" site "Mojo Mars" page, and download the file where it reads "...Quicktime movie...". 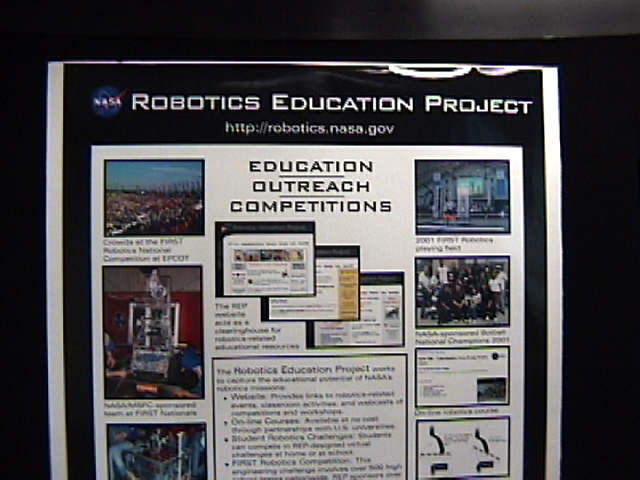 "Carnegie Mellon University presents a course in Robotic Autonomy in collaboration with NASA Ames as part of its West Coast Initiative"
"A seven-week robotics summer program for high school juniors and seniors to be held at Carnegie Mellon West, Moffett Field, California, July 1 - August 16, 2002"
"Robotic Autonomy, a new summer robotics camp offered by Carnegie Mellon University in collaboration with NASA/Ames Research Center. This course will introduce students to the electronics, mechanics and computer science of robotics, culminating in a series of autonomous robot challenges. 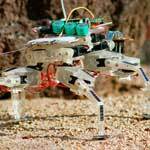 Students will build, program and operate vision-based mobile robots capable of sophisticated sensing and intelligent decision-making. At the conclusion of the course, each student will take a complete, vision-based robot home so that they may continue to explore robotics on their own". 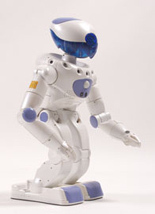 "ROBODEX started in 2000 as the first large-scale exhibition in the world to gather human symbiotic robots. In ... Expo ROBODEX 2002...The goal of ROBODEX is to provide people with "love" and "dream" through robots and to realize a society where humans and robots cohabit with each other". "New Sony Robot Has Steep Price Tag"
How Robots Will Change Us. SFRSA has a strong liaison relationship with NASA REP, Headquartered at NASA Ames in Mountain View, California. 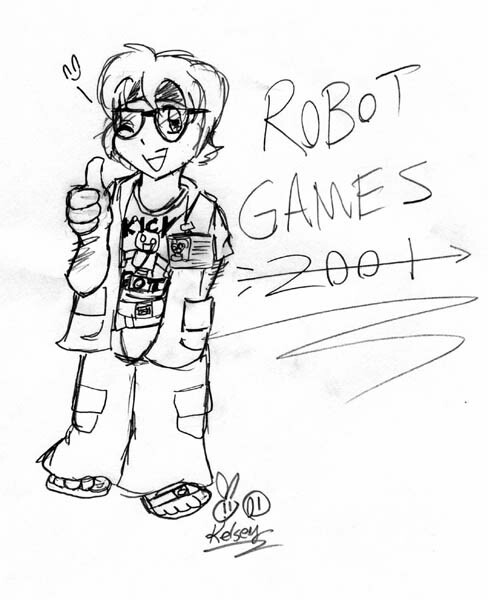 As our members often participate in NASA REP events such as their FIRST Robotics sponsorships, so REP exhibits at our SFRSA Robot Games & often post links to our site, such as one on their Homepage for the summer of 2001, June 16, which read "School's out...Now what?! ?...Why not get involved with robotics this summer?...There are activities for all ages and ability levels on some great sites on the web:...Check to see if there is a robotics hobby club in your area!...Visit the SFRSA web site for tips on Getting Started in Robotics!". NASA TV "Earth Views" archive video from orbiting Space Shuttle of rotating Earth (1,2), & animation of Robot Arm building Int'l Space Station (3), from the Human SpaceFlight Gallery. 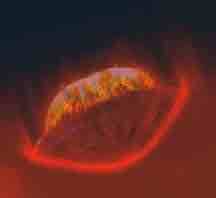 "On Saturdays and Sundays, NASA TV airs Earth Views beginning at Noon and continuing through 3am ET." Jonathon Robinson's Flash Music Video portrays the robotic Prime Directive. Jonathon's other works are also doing well. AIBO "K-9" vs. Thunder Lizard! Need a Japanese Robot website translated into English or an email translated into Russian? Give Alta Vista's "Babelfish" a try for a very usable 2-way "rough gist" translation across 10 languages. Trying to find a reference to a robot on a website the way it was sometime between now & 1996? 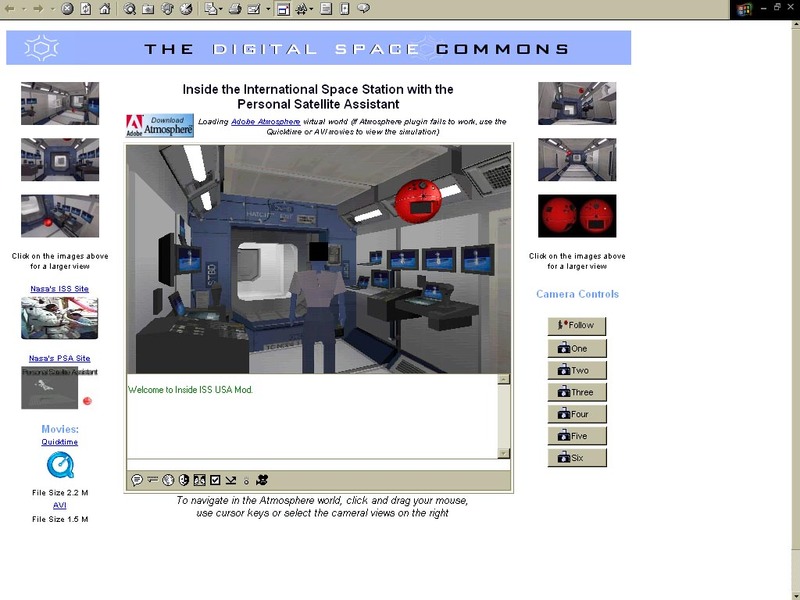 The Internet Archive Wayback Machine may have the page, as it does this Homepage of the NASA Robotics Education Project (REP) summer of 2001, June 16, suggesting "Why not get involved with robotics this summer?" 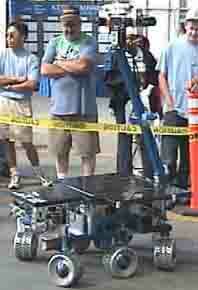 & recommending a "Visit the SFRSA web site for tips on Getting Started in Robotics!". Web site created , maintained & developed by SFRSA Mediameister Cliff Thompson, (anime Cliff by Kelsey Kraus), and WebBotChick,Toni Thompson. Built (mostly) with FrontPage and lots of hard work!